This week we sent the entire Geoloqi development team to ESRI’s annual User Conference in San Diego. We all had a great time being around people who enjoy location just as much as we do. Some of the 15,000 people at the 2012 ESRI User Conference. Photo: @kk for ESRI. ESRI powers a lot of everyday things that people don’t generally think about. From road planning and civic planning, to emergency response to environmental protection, the presentations were just a small sampling of the many users of ArcGIS and other ESRI tools. With so many applications, it was fun to talk with people about where they wanted to go next. A lot of them were very excited about ambient, adaptive, real-time location. The conference attracted a whopping 15,000 attendees (compare that to over 20,000 at SXSW Interactive this year). It was more than drinking from a firehose. It was as if each of the sessions was a .zip file that we had to fit into our already crowded brains. Although we only attended three days of the conference, we left feeling completely overwhelmed. It’s going to take a few weeks to process everything we experienced. Left to right: Pat Arlt, Kenichi Nakamura, Amber Case, Kyle Drake. Photo: @kk for ESRI. 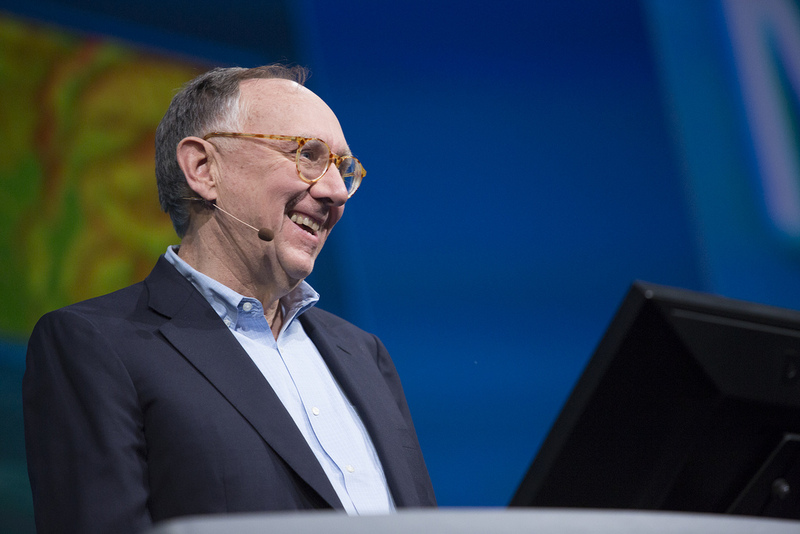 The first day’s plenary talks were all introduced by ESRI CEO Jack Dangermond, a fantastic and animated speaker whose passion was contagious. The entire room fit all of the attendees of the conference, which resulted in three massive projection screens. We got to go backstage to see all of the redundant video equipment and the sheer amount of technology needed to pull off the show. And because a lot of the AV tech are actually ESRI employees, they’re able to fine tune demos and presentations over time. All of the demos on the first day were so good that a lot of people didn’t think they were real. None of the live demos crashed, and the presenters were so polished that it felt like we were watching a cooking show. Jack Dangermond gives a plenary talk at the ESRI User Conference. Photo: @kk for ESRI. 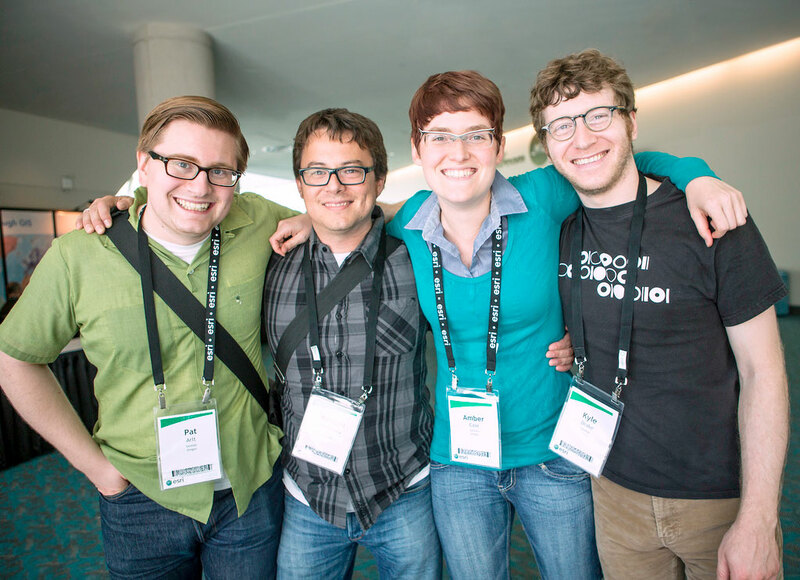 Why attend the ESRI conference? We’re geonerds, and it’s a geonerds dream to be here. A lot of people had recommended that we go to the conference this year. With some help from ESRI, we were able to meet a entire slew of interesting companies and startups, from small, two-person companies doing groundbreaking work in indoor mapping to Open Street Maps, a wonderful project whose data we rely on every day. In all, it was great to see a platform company that could enable so many solutions with a base set of tools. If you’re into geo, like us, then I’d strongly encourage you to attend State of the Map US (SOTM) on October 12-14th in Portland, Oregon, as well as this year’s WhereCamp Portland from October 13-14th, 2012. We’ll be hosting a pre-party for WhereCamp at Geoloqi HQ! Hope to see you there!